Electronic air filters provide a more comprehensive solution to the problem. Instead of a physical filter, they use an ionization chamber, which the air passes through as your HVAC system blows it into the ducts. The chamber ionizes any and all dust particles that enter it: causing them to stick to the sides of the chambers or a suitable collection plate, depending upon the type of filter. That provides more comprehensive dust cleaning than a simple screen filter would. As a result, there’s much less dust in the air and your home feels cleaner and fresher than it might otherwise. In and of itself, that’s a great reason to install an electronic air filter in your home. But there are more direct benefits to your HVAC system that you should consider as well. Clogged filters are a big problem when it comes to your heating and air conditioning system. 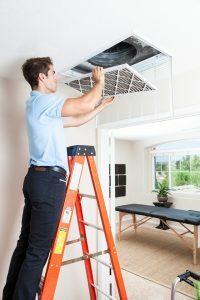 When they get congested, they can back up the flow of air through the system, meaning that heated air stays trapped inside the furnace (and cold air inside the AC in the summer). That, in turn, can cause major components to malfunction and could result in a breakdown if you’re not careful. Most heaters have safety features that switch the system off before any real damage occurs, but that still means you need to replace the dirty filter before you can run the heater. Electronic air filters eliminate those concerns while providing more comprehensive protection against dust and dirt in the heater. (Dust is a big worry with heating systems because it can clog burners and increase friction on moving parts.) That means that the air filter allows your furnace to function more effectively than it might without such a filter, as well as lowering overall wear and tear. If an electronic air filter in your Avon, OH home sounds like a good fit, call upon the experts at Westland Heating & Air to get it done!